ALUMINUM BOATS MANUFACTURED IN THE PACIFIC NORTHWEST, SUCH AS THIS CUSTOM WELD MODEL, ARE LARGELY UNFAMILIAR TO POTENTIAL BUYERS OUTSIDE THE UNITED STATES. A NEW PROGRAM HOPES TO CHANGE THAT. *Note: This article reprinted with permission from Soundings Publications, LLC. Nine Northwest marine companies — eight builders of aluminum boats and one trailer manufacturer — are taking part in an innovative program that will allow them to introduce their vessels to European boaters. The goal is to increase their exports and expand the region’s economy. “We couldn’t help but get excited,” adds Murphy, the father of one of the boatbuilder’s owners. Murphy helped his son get the company off the ground in 1997. The other businesses in the program are Bentz Boats, Custom Weld Boats, Gateway Trailers, Hells Canyon Marine, Renaissance Marine Group, Riddle Marine, SJX Jet Boats andThunder Jet. These companies build specialized aluminum boats (some with waterjet propulsion) that are probably unlike anything seen at Düsseldorf. A HULL TAKES SHAPE AT BENTZ BOATS. OWNER BRYAN BENTZ HOPES THE PROGRAM DELIVERS TRAINING IN THE AREAS OF INTERNATIONAL SHIPMENTS, EXPORTS AND FINANCING. SJX JET BOATS RECENTLY SHIPPED 30 BOATS (RIGHT) FOR THE ECUADORIAN MILITARY TO PATROL THE RIVERS BETWEEN ECUADOR AND COLOMBIA. Gary White of marketer P’Chelle International, who helped spearhead the program, says there are two levels of participation: Tier One companies had more than $1 million in gross profits in 2009 and Tier Two participants had less. Of those taking part, two companies are Tier One and seven are Tier Two. “Economic projections and industry experts show that the success of this program can lead to over 20 new direct boatbuilding jobs and 15 indirect jobs, with total additional earnings in the valley of $1.3 million,” according to the economic association. 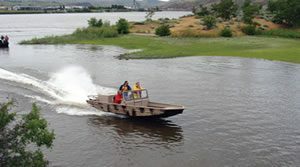 “I personally saw it as an opportunity to gain some greater exposure for the boats that we build, and through the program it sounds like there will be some training as far as working on international shipments, exports, financing,” says Bryan Bentz, owner of Lewiston, Idaho-based Bentz Boats. “I’m optimistic that something might happen…one of my goals is to take advantage of all the opportunities that I can,” says Doug Riddle, owner of Lewiston’s Riddle Marine, which builds about 25 boats a year for commercial and recreational markets. Riddle says he has done some exporting — he has sent boats to Nepal, Canada, Mexico, England and Panama — but he mostly sells in the United States and he’d like to expand his base. AZTEC FABRICATIONS TOUTS ITS PHANTOM LINEUP OF JETBOATS AS HIGH-QUALITY, HEAVY-DUTY, SHALLOW-WATER CRAFT.